Can’t make up your mind between candy and gum? 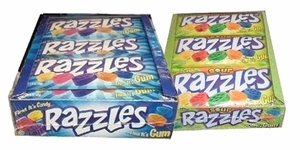 Stock up on Razzles, and you won’t need to decide! Delicious, fruit-flavoredRazzles candy transforms into gum as you chew, but stays just as tasty. Every round, bite-sized piece offers two treats in one. 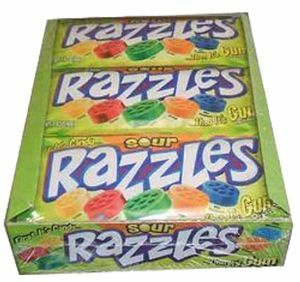 When Razzles were introduced in the 1960’s, they were only available in raspberry – which is what the little bumps on these disc-shaped candies were meant to represent. 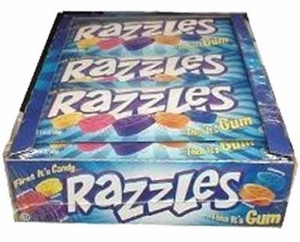 But today, with an assortment of five flavors both regular and sour, there’s a flavor ofRazzles gum for everyone. 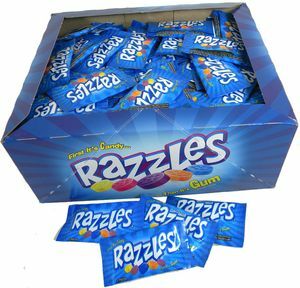 Shop our selection of Razzles for the perfect confectionery hybrid!